I finished my first game, and it's called Kuatro. 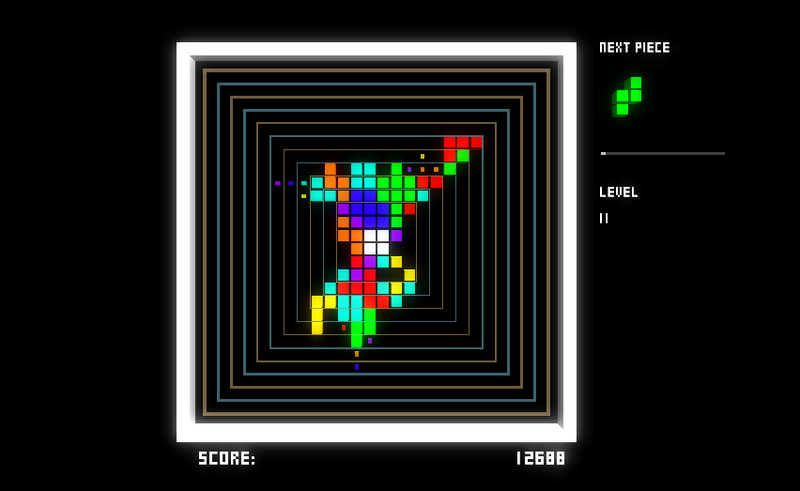 It's a tetromino-based arcade-puzzle game. I made the game from (mostly) scratch with Unity 3D, Sunvox, and Audacity (Photoshop helped too). You can purchase the game from both Gameolith, a multi-platform digital game distibution site, and the Mac App Store. See the Kuatro page for more info. I created an original soundtrack for the game, which you can listen to right here! 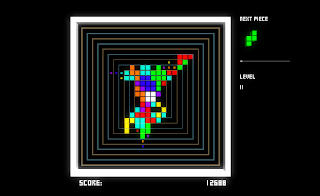 Kuatro is a tetromino-based game. You score points by making "rings" of tiles, and the more risky the strategy, the higher the score. More information coming soon. I think it looks pretty good. It's pretty unique looking, and it directly relates to both games (via programming and binary and all that) and uncountability as a concept. The logo is basically a stylized depiction of the Diagonal Proof, which is a way of proving that an infinite set, e.g. the set of real numbers, cannot be counted, because there's no way to match up every real number with a corresponding natural number (counting number). That's where the name "Uncountable Games" comes from. I did a concept for the first enemy you'll encounter in the game. Here's the "Baton Cop." I was trying to play off of a lot of the pictures that have been in the news lately, between the Occupy protests and the uprisings in the Middle East. So I haven't really been working on the FPS... My aspirations for it are far too great for the time, experience and willpower that I have. It seems like I keep coming up with projects, each with a progressively smaller scale, and I finally have reached one that I feel like I can actually complete. 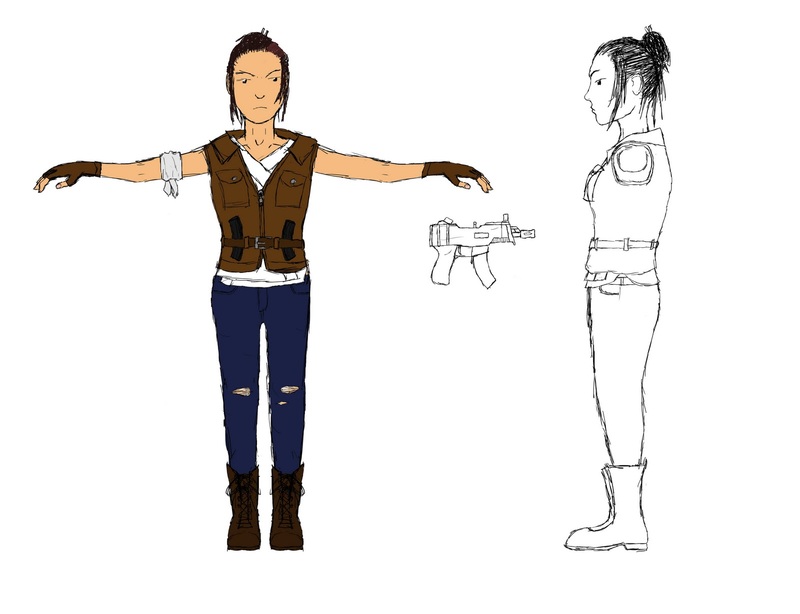 The first bit of concept art I made for the heroine. Titled, "Wtf are you going to do? I'm a Guninja." Rather than constantly spraying bullets at the undead, this game has the player constantly switching between ranged and melee combat. The player character uses a one-handed weapon, like a submachine gun, pistol, or sawed-off shotgun alongside a katana. The idea is that the two weapons complement each other and provide a variety of different tactics to use against a variety of different enemies. The player can shoot at enemies and the enemies can shoot back. I mean, if I were trying to save the world, I wouldn't exactly want to get shot, so cover is sort of a necessity. Rather than the standard cover system mechanic where one presses a button while up against cover to insta-glue the player character to it, the game would have the player push the virtual thumbstick towards cover they want to stick to. To pull away from it, the player simply pushes the stick in the other direction. Simply pressing the fire button causes the player character to pop up and shoot. There could also be mechanics like vaulting over cover or rolling from cover to cover. The game will have four controls: the movement thumbsick, the gun button/thumbstick, the sword button, and a jump/action button. To attack in the game, you can simply tap the sword button to slash. But to perform combos, the player must press the buttons in time corresponding to musical notes. The game will have a beat playing on a loop at the same tempo that the button combos need to be performed, and consecutive combos played on beat will give the player a bonus, either in damage or in points scored (think Guitar Hero). As the player gets a higher and higher bonus going, the music will get more and more energetic. The idea is that the player is a soloist, and the music in the background is comping. Just to give an idea of how this would work, there's a combo that I came up with. The gun would fire with a 16th note rhythm, so pressing sword, sword, and holding gun, with the values quarter, quarter, half would yield 2 quarter note long slashes followed by five shots with the SMG. The setting of the game would be a sort of oppressive dystopia in the near future. The government simply gets rid of those who raise a bit too much of a ruckus, has the family sign a document, and the person is never seen or heard from again. 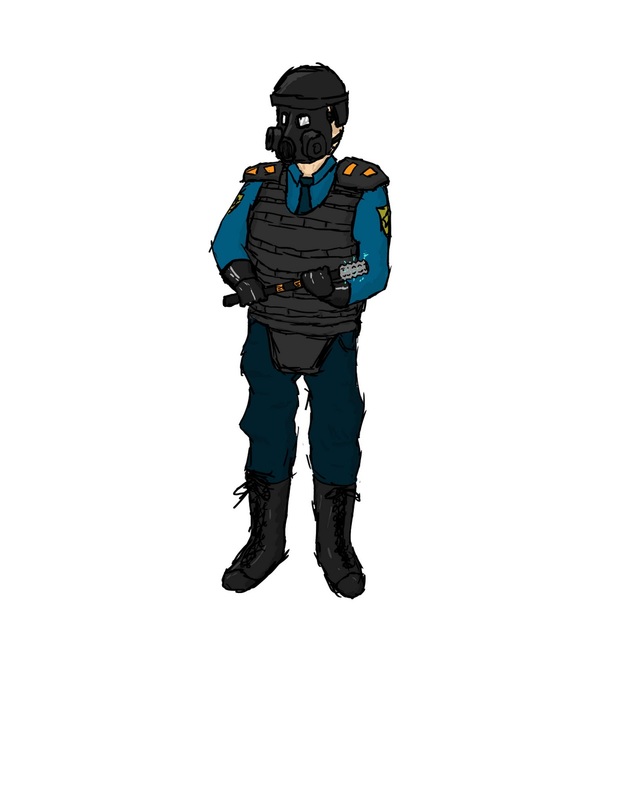 The main enemies in the game would be soldiers and policemen who appear almost inhuman with the sheer amount of riot gear, teargas grenades, bulletproof vests and pouches that they wear. The antagonist is a prime minister/president/dictator type person, a middle-aged man with a bald head and a pointy grey beard. I did some drawings for him on paper, and I liked the way he looked with a trenchcoat. It makes him look like the German SS during WWII, a silhouette that has long been associated with the evil stereotype. He's a very sinister character who takes things quite seriously while seeming to not care about them at all. He's so confident in the power that he holds over the people that it can't possibly be broken. It's sort of random how I came up with the protagonist for the game. I had sort of settled on making a twin-stick shooter with melee elements, and I came up with these three different characters that the player could choose from: a average looking dude who wielded an assault rifle, this big burly guy with a combination rocket launcher-warhammer, and a ninja girl with a submachine gun. I liked the "Guninja" the best out of all of them, and figured out how to mold the game around her. Reference image I used for the 3D model. I wanted her to look really down-to-earth and kinda average. 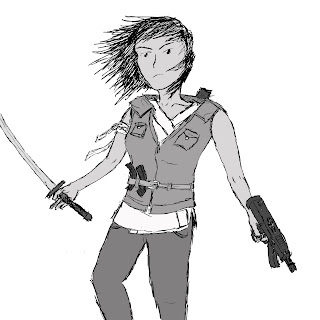 Right now the backstory I have figured out is that she was trained by a skilled martial artist/ninja/sensei-type person to topple the dystopia. It would be a lot like the first part of Batman Begins, except with few to no reservations about bloodshed. One of the things I want to do with the game is to make the player feel responsible for his or her actions, especially when it comes to killing enemies. At some point in the game, probably on one of the later levels, the antagonist will point out that the player character has killed hundreds or thousands of people, people with families and lives, people who followed the rules. That may be a bit too serious of a tone to set, but I'll see once I get to that point. It's still a long ways off! So far, I've made a pretty good model and an okay texture for the player character. I've also done the rigging and some basic animations. On the Unity side of things, I have the cover system pretty much figured out, and I've done some experimenting on how to keep track of the music while the game is being played. Here's a video of the game as it is right now. So you get a primary weapon, a secondary weapon, two attachments for each weapon, grenades, and three perks. This is all well and good, and there's a very wide variety of weapons and perks and stuff that you can make your Create-A-Class from. Here's my issue though: In the single player, the game gives you a silenced ACR with a heartbeat sensor and a red dot sight, but this setup is impossible to replicate in the multiplayer. At most, you can have two attachments on your gun. The game doesn't have attachments, but has a "shop" system, where you can purchase a primary weapon, a pistol, assorted grenades, and other equipment. At the beginning of each round, every player is given some money, the winning team's members are given even more money, and during the round, each kill is worth a certain amount of money. If the player survives a round, they keep the weapons that they purchased or found during the previous round, and otherwise they have to buy all new weapons. For a game that's already terribly un-noob-friendly, the shop system gives the better players a big advantage over the worse players. Nothing sours a session of CS:S than having to survive a round with just a USP. The player is given a budget for how much equipment they can have in their loadout, let's say 200 points. -Primary weapons (assault rifles, SMGs, shotguns, sniper rifles) all cost the same amount, 75 points. -Attachments for primary weapons cost 10 points. -Attachments for pistols cost 5 points. -"Skills" (same idea as Perks in MW2) cost 15 points. -Grenade launchers (not an attachment, a standalone weapon like this) cost 30 points. -Extra magazines cost 5 points. I'm still thinking about what sorts of weapons and such I want to have for the final game, and of course all the prices are still in "alpha." It'll be an interesting thing to balance; all the items that are the same price can be balanced against each other, but it's hard to compare a grenade launcher to two perks, for instance. Uncountable Games is a game studio currently comprised of one student who wants to make interesting games. © 2013. Powered by Blogger.